The February birthstone is the beautiful amethyst. This semi-precious stone is a violet variety of quartz that possesses a hexagonal crystal system. Considered one of the cardinal gems in the Old World, amethyst has been used in jewellery pieces for millennia, dating back to 3,000 BC and Ancient Egypt. Having long been a symbol of health and luxury, amethyst has also been linked to religious and royal jewellery throughout the ages. This versatile stone is beloved by many for its gorgeous hues, which range from light to deep purple; the perfect colour for February and the most romantic day of the year. Due to its wine-like hues, Ancient Greeks have associated the amethyst with Bacchus, the god of wine and excess. They also believed the stone protected against intoxication, so they often wore it and even drank from goblets made from it to prevent feeling drunk. In fact, the name ‘amethyst’ derives from the Greek word ‘amethystos’, which can be translated as ‘sober’. In medieval Europe, soldiers wore amulets made from amethyst, because they believed it could protect them in battle and even heal them. Anglican bishops are known to wear an episcopal ring set with amethyst, as well. The February birthstone is thought to be sacred to Buddha by Tibetans, who make prayer beads from it. The gem can be found in abundance in Minas Gerais in Brazil, where it occurs naturally in large geodes within volcanic rocks. Amethyst can also be found and mined in South Korea, Russia, India and Africa (with Zambia producing around 1000 tonnes a year). The largest amethyst vein in the world is in Austria. Colour – The violet colouration of the amethyst is due to gamma irradiation, iron impurities and presence of trace elements. The value of the stone is not typically defined by carat weight, but by colour, with the rare Deep Russian being the highest-grade amethyst. The deeper the colour, the more valuable the amethyst; however, when an amethyst stone exhibits a very light colour or a mixture of both light and dark, its value decreases. The gem can also exhibit one or more secondary colours, such as red or blue. If overexposed to light, amethyst’s hues can fade. Hardness – This gemstone is a 7 in the Mohs Scale of Hardness and doesn’t break by cleavage, making it durable and suitable for use in everyday jewellery, be it rings, bracelets, necklaces or earrings. Clarity – Clarity is highly sought after in amethyst stones. They are rarely found with visible inclusions, and gems which exhibit them tend to be less valuable. 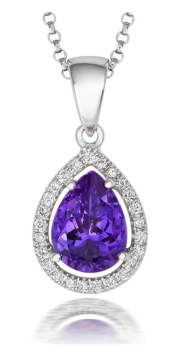 Cut – Amethyst can be cut into several shapes, from round, oval and emerald to cushion, pear and triangle. Gemstones with eye-visible inclusions but with a beautiful hue tend to be cut as cabochons. This semi-precious stone is also incredibly popular for artistic, one-of-a-kind designer cuts. Durability – The February birthstone is a gem that will last a lifetime and more. One of the most famous examples of amethyst artwork is the Roman Intaglio, a stone that is engraved and carved in such a way that the engraving can be viewed through the stone. Some of these Intaglios only began to deteriorate from the 2nd century AD onwards. Kent Amethyst Demi-Parure – In her jewellery collection, the Queen possesses a beautiful set of amethyst jewellery, known as the Kent Demi-Parure. Owned by Queen Victoria’s mother, the Duchess of Kent, the jewels have passed down the generations and have been used by Queen Elizabeth II since her coronation. The collection includes three brooches, a necklace, a pair of earrings and a pair of hair combs. Delhi Sapphire – Despite its name, this gem is an amethyst, not a sapphire. It is also known as the Cursed Amethyst due to its history; taken from the Temple of Indra in Kanpur during the Rebellion of 1857, the stone was found by a curator of the British National History Museum, who ignored the curse warning and fell ill with kidney stones. The stone’s last owner locked it away within seven boxes in a bank safe and requested that it not be moved until three years after his death. This amethyst is now in the Vault of the National History Museum in London. Morris Amethyst Brooch – Weighing 96 carats, the heart-shaped amethyst in this brooch resides in the Smithsonian Institute and is believed to have come from Brazil. It exhibits a deep rich violet colour. It’s thought that the jewellery piece was made during the Edwardian period. 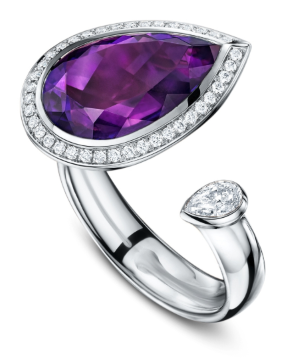 Amethyst jewellery is the epitome of luxury. Possessing an unparalleled regality, amethyst was once so rare that only kings, queens and the clergy were able to afford it; today, you can purchase a beautiful piece of jewellery where this gem reigns. The magnificence of the gemstone is equal to its durability, making a jewel to last generations. Our amethyst jewellery is perfect as a gift for Valentine’s Day and will proudly glimmer with an elegant brilliance your partner will love. Amethyst is also the 33rd-anniversary gemstone. Unrivalled in beauty, the February birthstone is an amazing gem that can add a touch of sophistication, class and contemporary appeal to any wardrobe. We stock a vast range of amethyst jewellery – as well as other birthstone jewellery – so visit us in Lancaster and Kendal to see our beautiful pieces for yourself.